For accuracy, check nut size with a socket wrench. Reduce your risk of wheel detachment accidents. 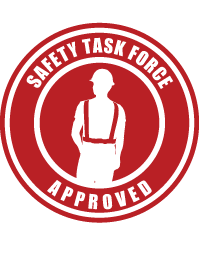 (Protect the public, help prevent property and load damage). Quickly identify a hot wheel possibly caused by bearing failure or brake drag. Clearly visible at night and in bad weather (rain, snow, muddy conditions). 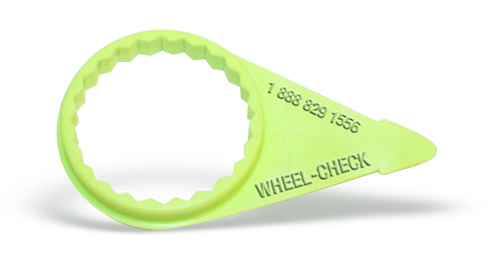 Wheel-Check® is a loose wheel nut indicator that can identify a loose wheel-nut with a simple visual inspection. When the wheel nuts are properly torqued to specs, the Wheel-Checks are then placed on the wheel nuts in a uniform pattern. The way the Wheel-Check® system works is once a wheel nut has loosened, the Wheel-Check® will become out of sequence. It will be visible when the driver does his walkaround check and it is the driver’s responsibility to call maintenance and have the wheel thoroughly serviced.